It’s that time of year again. Everyone is partied out and making their New Year’s resolution so they can be more in shape, look better in their swimsuit, or be a little smarter by reading more books than they ever have before. 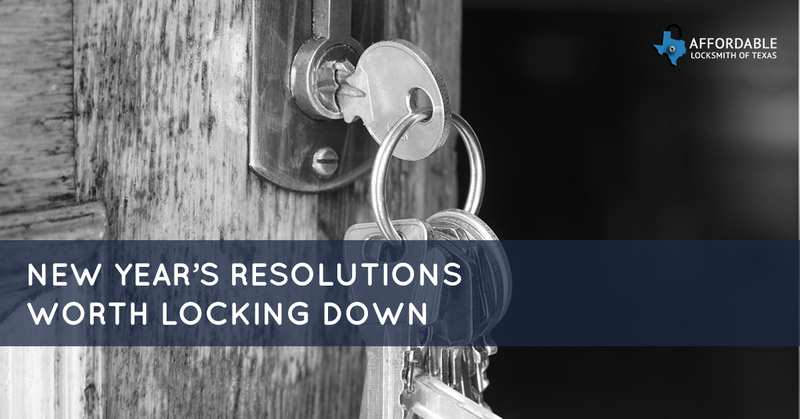 Regardless of what New Year’s resolution you made or if you might have already let it slip by, we at Affordable Locksmith of Texas have an idea for a new type of New Year’s resolution: why not make a resolution to have the best security that you have ever had? Not only will practicing better security habits and installing better systems keep your home safe, but it will give you and your family in The Woodlands peace of mind now and throughout the new year. This is one of the easiest ways to have better security. If you’ve recently bought a new home, you will want to rekey your locks so that if, for one reason or another, someone who had access to the keys before decides to let themselves in, they will find their plan foiled. Rekeying your locks is fairly inexpensive. However, if you don’t want to worry about losing your keys or your kids leaving their keys somewhere, switch to an electronic system. An electronic system isn’t just for businesses anymore. Many homeowners in The Woodlands are opting for electronic locking systems because of their convenience and the reliable security they provide. Say goodbye to lost keys and forgetting to lock the door! All systems can be reset to a different code whenever you want and some even allow you to check if your door is locked through an app on your phone. Installing a completely new system is only a part of what it means to implement better security. Practicing better security habits is also a major part. Better practices can include trimming the bushes away from your home, leaving on a light, or having a light on a timer to illuminate your home at night. Another simple practice to implement is locking the door. Even if you live in a safe neighborhood, locking your door can make a world of difference between an intrusion and an invader moving on to break in somewhere else. Homes that can be broken into in less than 10 minutes are usually the most susceptible to break ins. The best way to protect yourself is to put yourself in the shoes of a home invader and to analyze where your home’s weak spots might be. Just like many aspects of your home, your locks also need maintenance. Thankfully, your locks don’t need as much love as your gutters, but they do need some time and attention. Some simple lock maintenance can include clearing your locks of dirt and other debris, as well as oiling your locks with the proper lubricant. Clear away dirt and debris as often as needed and oil your locks regularly—every few months, depending on their use and the elements they are exposed to. Keeping your locks in working order will allow them to work properly all year long. If your locks, even after proper maintenance, still aren’t working well it may be time to replace your key with one less worn or to call your local locksmith in The Woodlands and have them take a look at your lock. We hope that with the start of 2018, as we hope for our neighbors in The Woodlands every year, that you will have a year of health and happiness, and safety. Whether you decide to make safety part of your New Year’s resolution or not, we hope that you will continue to lock your doors and invest in the security that you and your family deserve. Be sure to call Affordable Locksmith of Texas for all your installation, maintenance, and troubleshooting needs.